Queso Fundido recipe is amazingly cheesy and is an easy dip to make for your next party, game day or Mexican food night! 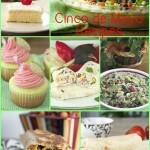 This can be your main course served with tortillas or an appetizer served with chips. 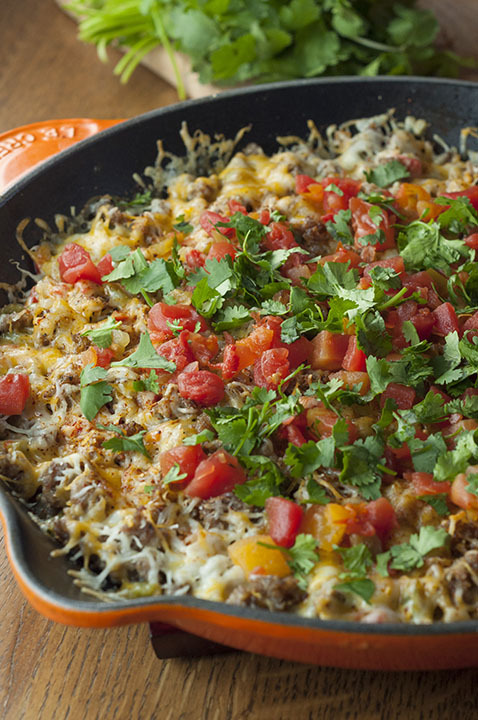 This Queso Fundido has “breakfast” written all over it. OK, not really, but I’m staring at the photos of it right now as I put this post together and I want to eat it for breakfast. It’s just SO tasty that I totally want to face plant into the middle of this skillet and resurface when it’s finally spring and the sun is shining abundantly. Is that so wrong? I used my all-time favorite brand of diced tomatoes (Tuttorosso) in this recipe to cut back on some of that dicing and slicing time. The faster I can get this on the table, the better! 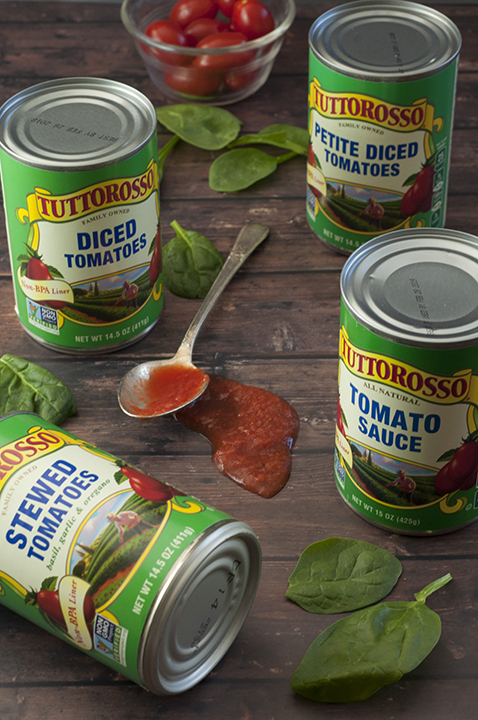 My pantry is 24/7 stocked with a variety of Tuttorosso products…simple because…they are the best. They make an amazing variety of all natural tomato products to meet all of my cooking needs. 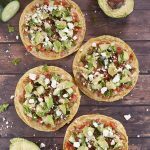 There is a reason why they are the best-selling Italian inspired canned tomato brand in the U.S. You all know me and my love for Italian food, but Mexican food comes in a close second! This is where this delish Queso Fundido comes in. You can totally stuff this deliciousness into some warm tortillas and call it dinner or dunk your favorite tortilla chips in it for a party time appetizer. I’ve been loving Tuttorosso products for years and they have always been my “go-to”, but I love them even more now that they have their new products out with smaller 14.5 oz. and 15 oz. cans. It’s just so much more convenient when you need a smaller amount of the particular Tuttorosso ingredient and don’t have to worry about wasting the leftovers! I was fortunate enough to visit Tuttorosso’s headquarters in Indianapolis back in the fall and wrote all about it here along with my recipe for Crock Pot Italian Meatballs. I already knew they were a great family-owned business, but I had the privilege of seeing and experiencing firsthand just how wonderful they are and the pride they take in the quality of their product. They definitely do NOT cut corners when it comes to what they provide to their customers! Tip: Tuttorosso products can be purchased on Amazon or use their store locator to see where you can get their products nearby! Queso Fundido recipe is amazingly cheesy and is an easy dip to make for your next party or Mexican food night! This can be your main course served with tortillas or an appetizer served with chips. In a large skillet, cook and crumble the sausage until no longer pink. Remove from skillet with a slotted spoon and drain on a paper towel-lined plate. Pour excess fat out of skillet. Add onions and bell peppers to the skillet and cook over medium-high heat until the veggies are softened, about 6-8 minutes. Remove from heat and set aside. To build the Queso Fundido in your OVEN-PROOF skillet (use a shallow baking dish if you don't have one), place ⅓ of the cheese on the bottom. Add half the sausage on top of the cheese. Add another third of the cheese and then as much of the veggie mixture as you prefer. Add almost all of the remaining cheese, the remainder of the sausage, then the cheese you have left. If you have a bit of ingredients left over, that is fine. Make sure ingredients reach top of skillet or dish. Lightly sprinkle chili powder over the whole top. 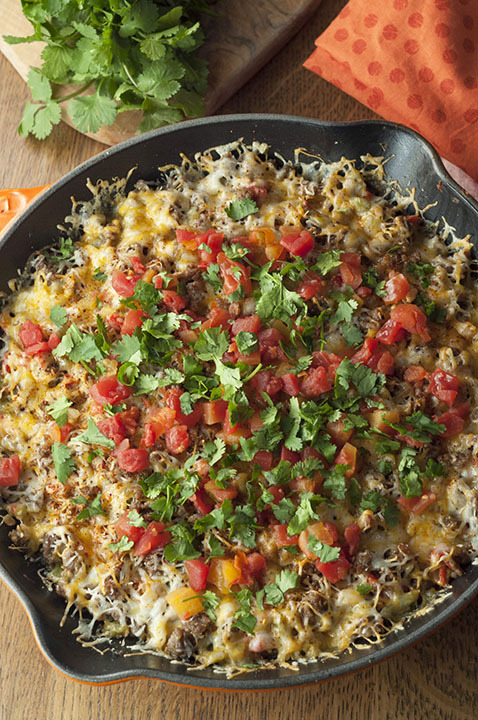 Remove from the oven, evenly top with the diced tomatoes and cilantro, and serve immediately (it's best when hot) with tortilla chips! This definitely has breakfast written all over it! I want to bury my face in this dish! This sounds easy and looks so very tempting! 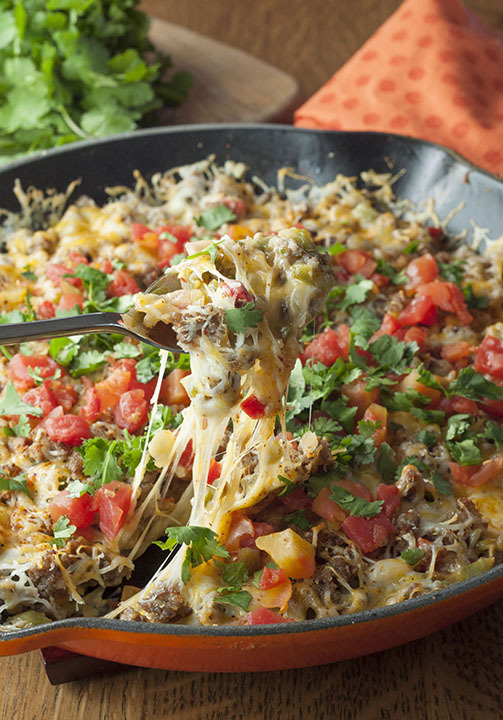 Who doesn’t love a cheesy dip. So much fun!! This has my name written all over it, SO in this the mood for this right now! Oh my! 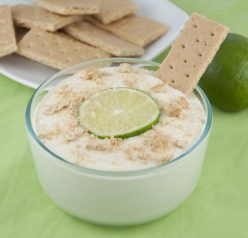 This dip is right up my alley! Looks delicious!